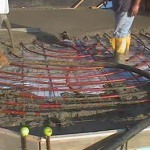 Tubing installed in an unconventionally shaped slab. The final result will be a beautiful, radiantly heated sunroom. A pumping unit was used to fill the form with concrete. The 7/8″ PEX is not delicate and easily withstands the stress of the heavy hose. Flexible tubing layout: Unlike the original days of radiant heat when rigid copper was installed in concrete slabs, the modern PEX tubing allows easy and graceful installation into a form of any shape or configuration.